New customer and new project for CRE8! We are in particular grateful and proud for being given this opportunity to provide our customer with CRE8’s cost-effective and flexible design. 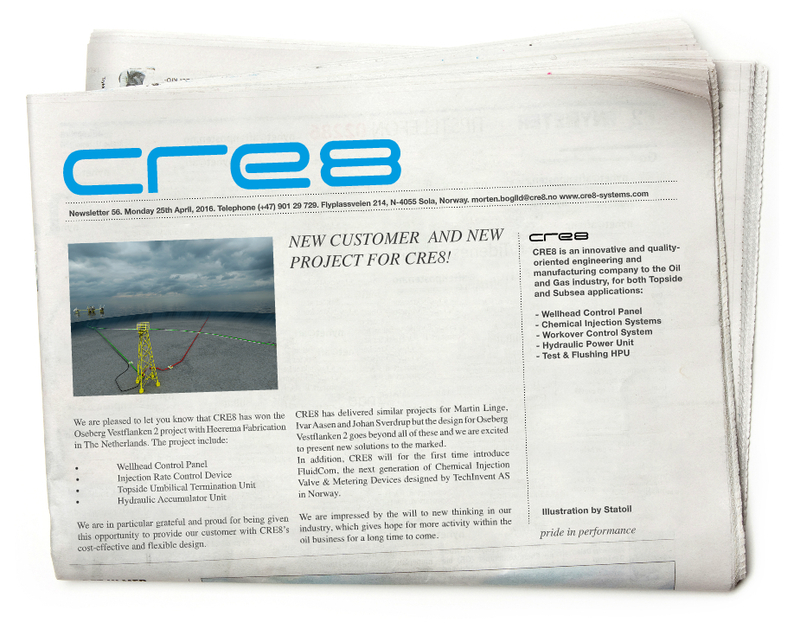 CRE8 has delivered similar project for Martin Linge, Ivar Aasen and Johan Sverdrup but the design for Oseberg Vestflanken goes beyond all of these and we are excited to present new solutions to the marked. In addition, CRE8 will for the first time introduce FluidCom, the next generation of Chemical Injection Valve & metering devices designed by TechInvent AS in Norway. We are impressed by the will to new thinking in our industry, which gives hope for more activity within the oil business for a long time to come.